Alexander Wells has a dynamic and vibrant style. 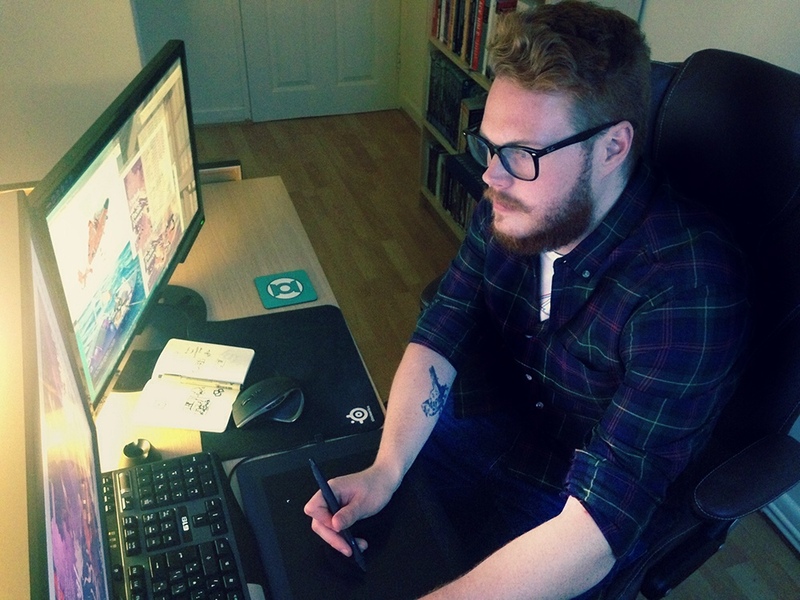 He uses a mix of both traditional and digital mediums to create images, allowing him to tackle a diverse range of briefs. How would you convey your illustration in five words? Bold, Vibrant, Dynamic, Digital …um, Caffeinated? If you weren’t an illustrator what would you be? Definitely something around design. I love looking at new work from any artist. I would like to be on the other end of a project sometimes – being the person to search out the perfect illustrator for a brief and waiting to see what was produced. What is your favourite project to date? Although it sounds a bit corny, I really try to start each project with the attitude ‘this will be best thing I’ve ever done.’ It became a running joke at university that whatever piece you had just finished would be nothing compared to the next image. It works in keeping me motivated to always try to push the image a little further, even if the subject matter might not be stereotypically an exciting brief. Saying that, I got to work on the ESPN Sports Center background for the Mayweather versus Pacquiao fight a short while ago, which was exciting because of all the hype around the fight (just nobody mention the outcome). Pick three things that are most valuable to you in your studio and explain to us why you have chosen those and what story there is behind them. Aside from the obvious choice of my PC, I would have to pick my copy of ‘Calvin & Hobbes ‘Weirdos From Another Planet!’ which I was given at 6 years old and I continue to reread it today despite all the sellotaped pages. My second would be my limited edition Tomer Hanuka print that came with the 1st edition of his book ‘Overkill’; it hangs on my wall behind my head. Lastly I’d probably go with my 1:1 replica ‘Green Lantern’ Lantern; it’s incredibly nerdy but more importantly it’s awesome. Haters gona’ hate. Working freelance is a very solitary job, which I personally love…but it’s really great having someone in your corner. Being part of an agency gives you more confidence in talking to clients and allows you to concentrate in producing the best work you can without having to stress over negotiations or unreasonable demands from clients. It’s so good to know they are out there actively searching out work for you; it’s invaluable. What do you do when you first approach a project? First, I reread the brief and pull out lines or phrases that resonate with me. I have a little sketchbook with the most incomprehensible thumbnails in which I will start to draw in order to work out ideas/composition. Once I have my ideas, I’ll start to sketch out the ideas digitally – I have a colour palette in mind before sketching the majority of the time. I find even if I just pick one main colour that suits the mood of the image it can help guide the atmosphere completely. Coffee, more coffee, check Reddit, check emails, re-check Reddit, turn up some loud music and open up whatever I was working on the day before or start a fresh with a new project. I tend to work through lunch and try to keep regular working hours when I can or I find I burn out. Although working late and weekends is pretty common, it’s not so bad when you can stick on a podcast to work along to. In what ways do traditional media inform your digital style? I only started working completely digitally a couple of years ago so all my inking choices are made with the knowledge of how it is to make the lines traditionally with my Micron pens.